Everyone’s talking about coaching at the moment. One reason for this is that is an element of positive psychology that can be applied to almost any aspect of life, be it sporting, professional, social or private. At its worst, coaching can appear a huge unwieldly mass of insider talk and acronyms. At its best, coaching involves helping individuals to attain their own full potential, on their own terms and in a realistic manner and time-frame. If this sounds like learner autonomy, individualization and empowerment to you – then read on. 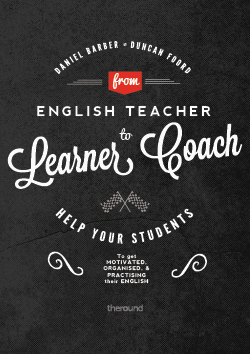 Drawing on elements of coaching techniques, From English Teacher to Learner Coach suggests how language teachers can redress the situation still prevalent in many a language classroom, where learners turn up to be taught by a teacher, sometimes do their homework. And nothing more. Nobody really wants to teach like this anymore, do they? Classrooms are artificial situations, so it is understandable that learners sometimes suspend their usual autonomy and wait to be “fed” the language. But globalism. budget flights and the pervasiveness of the internet in our lives means that most learners have more access than ever before to a rich variety of English resources and activities. They just need to find out how best to use these vast resources and then learn to integrate their learning into their daily lives. One of the exercises was “Learner or User”, where participants are encouraged to reflect on their own attitudes to language learning. I tried this out in a couple of classes and predictably enough the students who tended towards reflection anyway were fascinated by the idea that they could call themselves “world citizens,” rather than “learners”, whereas my more strategic students quickly worked out that “learner” meant “classroom” meant “bad,” whereas “user” was practical and proactive and “good.” Yet even the latter group seemed to note the significance of my allocating the lesson time to discussing this bit of meta-language to describe them. Spending time was a way of privileging the subject, and they referred back to their own assessments of themselves in later classes. Most good language teachers are already using coaching techniques, perhaps without knowing it, but it always helps to have a vocabulary to structure your thoughts and it doesn’t do any harm to have some fresh ideas on how coaching structures can be adapted to the classroom and beyond. This book is particularly good on this, and as you would expect from indie publishers “The Round,” it offers a wide variety of exercises and activities within its niche that can be adapted to almost any level or situation, be it young learner, business, one-to-one, or group/peer support activities. In other words, it substitutes a fixed curriculum for ideas which can then be customised. My favourite moment in this book was the comparison made between language learning and Weightwatchers ™. Nobody joins Weightwatchers and expects to lose weight by attending the meetings alone. So why do some students expect to learn English by simply turning up to the lesson, being fed their dose of English and nothing else? Weightwatchers™ members know that the onus is on them. The meetings are to motivate, advise, organize and give feedback. Not for nothing is the subtitle of this book: Help your students to get motivated, organised and practising their English.